Happy National Dairy Month everyone! Our family loves dairy products and we appreciate all of the long hours and hard work that dairy farmers go through 365 days a year. 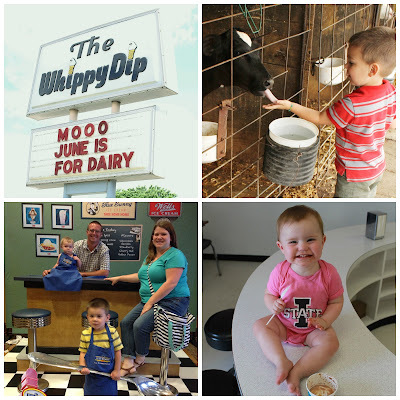 Did you know that Iowa has over 1,400 dairy farms? 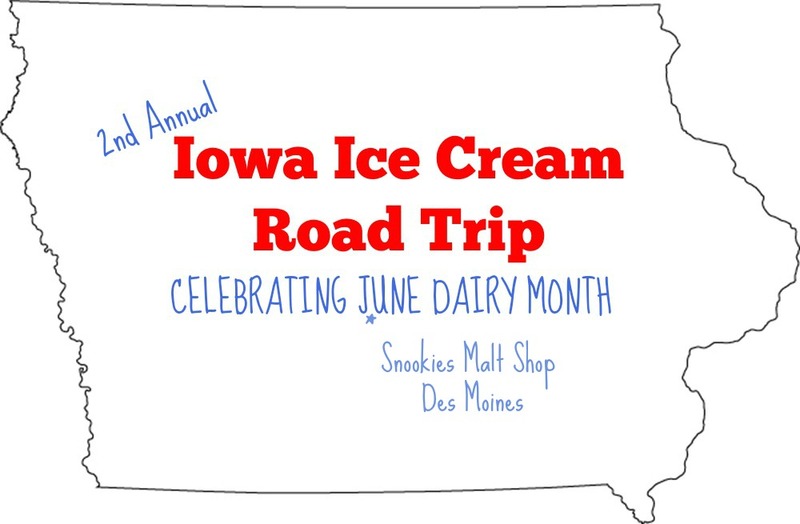 During June Dairy Month last year our family made an effort to celebrate dairy farmers by visiting small town, local ice cream shops throughout Iowa (and if they're open only seasonally, the better), and we're doing it again this year! I know, a small price to pay to show our support, right? 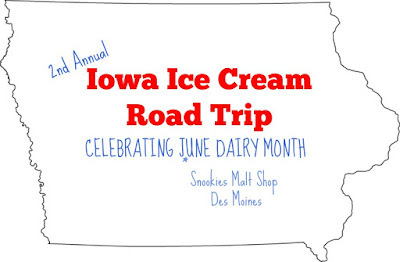 We are an ice cream loving family and it is fun to go on Iowa road trips to discover these fun and nostalgic places. 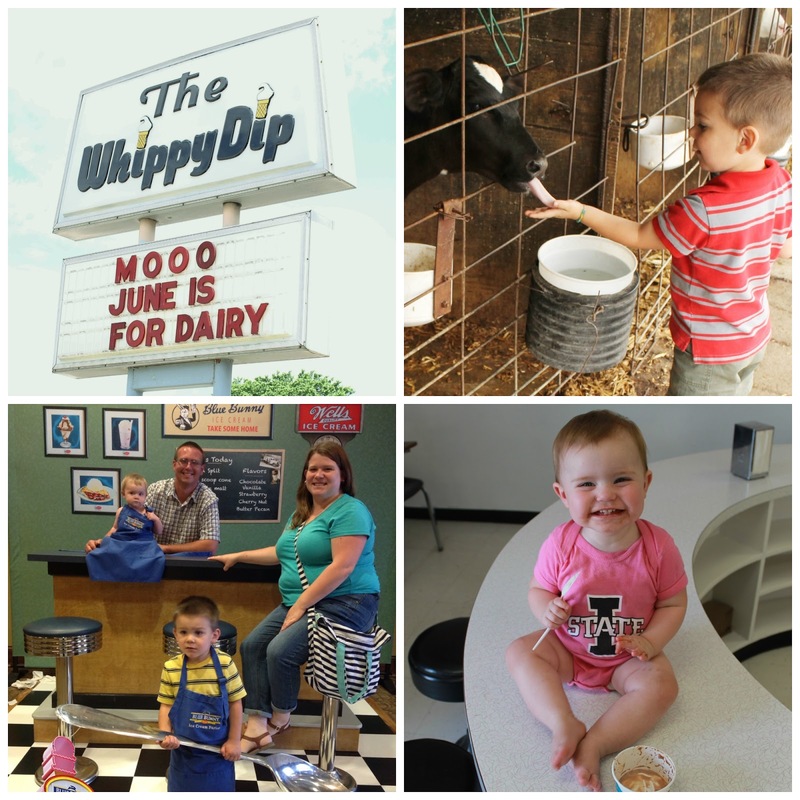 Last year we visited The Whippy Dip in Decorah, Hansen's Farm Fresh Dairy in Hudson, Blue Bunny in LeMars and Birdsall's in Mason City. 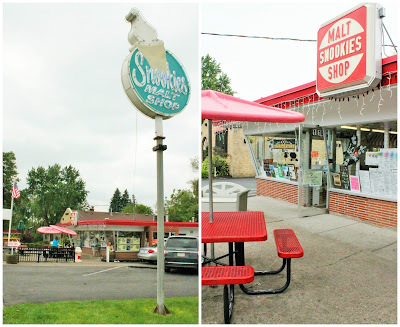 Earlier this week we headed down to Des Moines and figured we needed to go to one of their classic ice cream shops, Snookies Malt Shop in the Beaverdale neighborhood. An added bonus was that we were able to invite some of our extended family that lives in the area to join us! with a Maybe cookie on top! 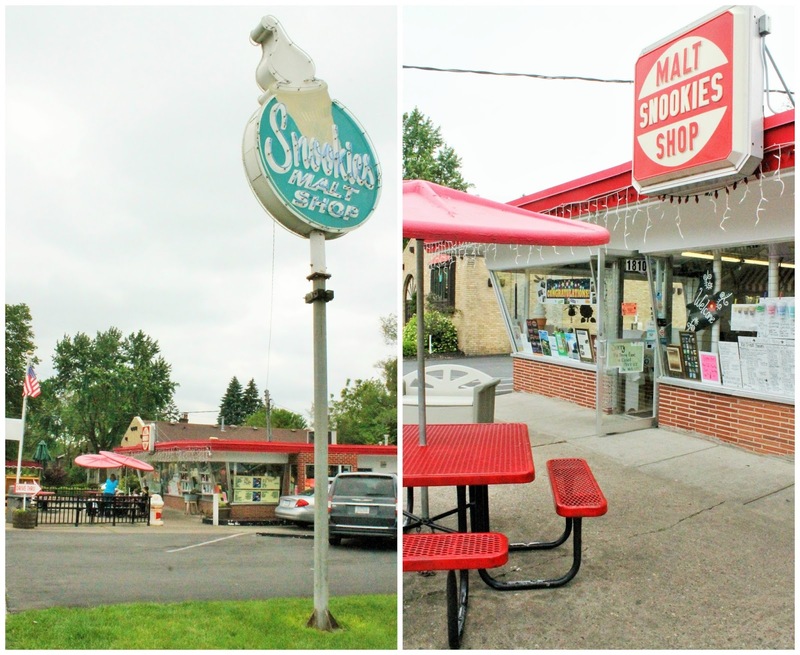 Snookies Malt Shop is a retro ice cream drive-in that serves soft serve. They are known for their malts (hence their name...) and their free puppy cones. When I stepped up to their walk-up window (they also have a drive-in and sit-in dinning room) I asked the staff what their top seller was and they replied with chocolate malts, but then one of the gals working added that her favorite was a hot fudge malt. So, I told her I'd take a hot fudge shake (sorry, I just don't care for malt flavoring). It was a classic, soft serve shake and I enjoyed the hot fudge. A fun treat that they add to all of their shakes and malts is a short bread cookie as garnish (and an animal cracker on other classic ice cream dishes). What makes Snookies special is the atmosphere. It is family friendly and you can tell that the Beaverdale neighborhood takes a lot of pride in it. In fact, there are people that camp out for their opening day every April! It was fun to meet up with one of my sisters, my nephew, a cousin, and her son for our initial stop on our Iowa Ice Cream Road Trip. Have you ever been to Snookies Malt Shop in Beaverdale? Do you prefer malts or shakes? Remember to Comment for a Cause! Yummy! Here in Texas, we are thrilled to have our beloved Blue Bell making it's way back on to shelves. I am so thankful because this would have been my first Texas summer in 30 years without Blue Bell! P.S. I love those little shortbread cookies! Our first stop on our vacation this summer is LeMars. We are going to have ice cream for lunch! I love this idea! We will have to look for Snookies the next time we are in Des Moines! LeMars was really neat last year. We went on the Friday of Ice Cream Days and enjoyed going to the Blue Bunny Ice Cream Parlor and Museum, checking out the painted ice cream cones around town, going to a Kids Fest in the park, and going to the Plymouth County Historical Museum. We also have some friends in the area so they gave us a driving tour of town. Have fun! I love a good hot fudge malt. If you ever decide to come to Goldies Ice Cream and Sandwich Shop in Prairie City let me know. I'd meet you there. One fun thing about Goldies is they rotate though a different soft serve "flavor of the week" along with the standard chocolate and vanilla. Currently it's Georgia Peach. Plus, you could enjoy one of their award winning tenderloins... and the Neal Smith Wildlife Refuge is nearby too. I look forward to reading about the rest of your stops. I actually went to Goldies earlier this year with Food & Swine's Cristen Clark! I loved their tenderloin and onion rings. I had a hot fudge shake too! I should keep them on my list for Ice Cream Tour locations for the future and I'll let you know if we come your way! Snookies looks like a gem. I love the cookie garnish. It's a nice little extra! I've never been, but I really want to! We should road trip to Des Moines some time Donna and we'll go!